This morning I saw a dragonfly perching at the end of a withered gladiola branch through my window. I quickly gathered my camera, left my coffee on the table in front of my computer, and sat on a chair on the patio facing my little garden patch. 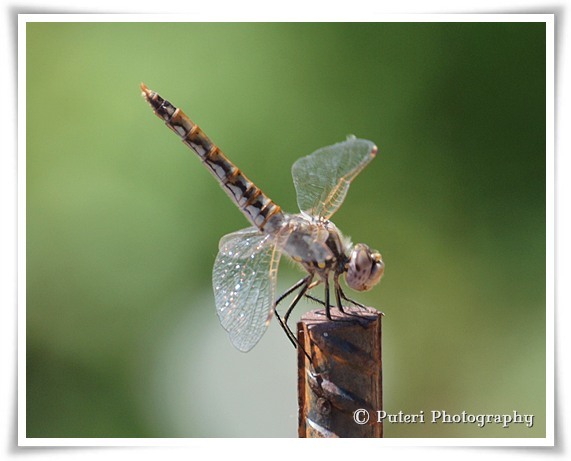 Well, when no dragonfly decides to perch any where near you, you tend to get bored. So I went back into the house, grabbed and carried the small patio table in the back patio to the front. Then I went back in again for my coffee, and a radio. My patience was rewarded. Not only did a dragonfly find a spot to perch on, a little hummingbird kept coming back to feed on the nectar of the morning glories! 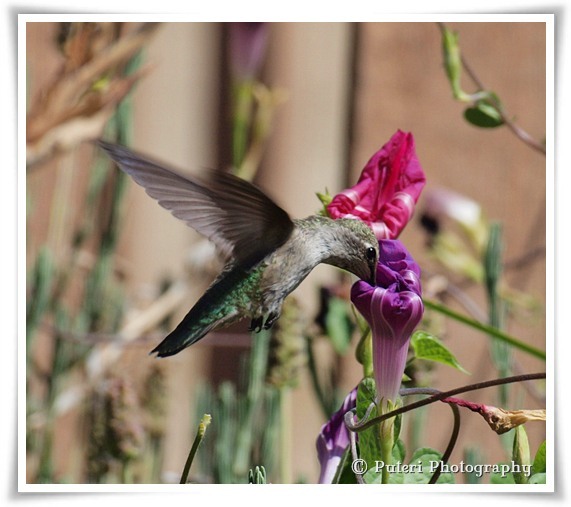 I took several pictures of the dragonfly and the hummingbird! Patience is something you have to learn to deal with when you want to photograph birds and flying insects!